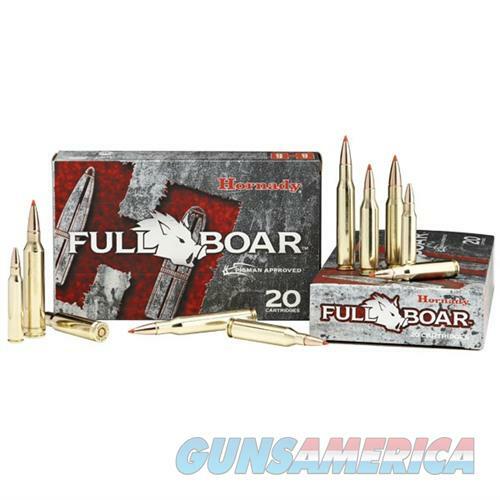 Description: Hornady 80987 FULL BOAR AMMO 308 WINCHESTER 165GR GMX Full Boar ammunition from Hornady? features hard hitting GMX? bullets for deep penetration and maximum weight retention. These monolithic copper-alloy bullets deliver 95+% weight retention and uniform, controlled expansion for unmatched terminal performance on the toughest game. Loaded with premium components, Full Boar ammunition is available in a variety of popular calibers and is designed to work flawlessly in all guns, to include ARs and other semi-autos. The GMX? is California compatible and approved for other areas that require the use of non-traditional bullets. Hornady? Full Boar ammunition proudly made in the USA!